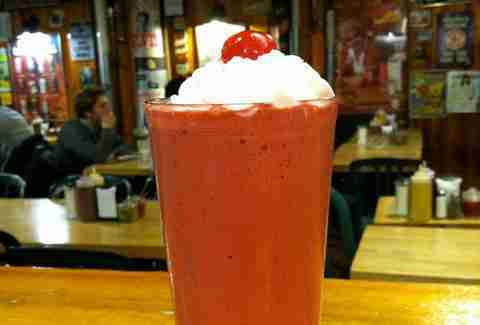 When you think of Bartley’s, two things come to mind: burgers and frappes. Thick, creamy frappes (remember... they are COMPLETELY DIFFERENT from milkshakes). Naturally, they have the basics covered, but the Harvard Square institution also likes to explore a little with concoctions like the Cherry Bomb (vanilla with chocolate chip cookies, cherries, whipped cream), The Elvis Frappe (chocolate with Reese’s Cup and banana "all shook up"), and the Strawberry Shortcake Frappe (vanilla with strawberries, shortbread, and whipped cream). Combine one with a burger and you will not move for four weeks. For over 35 years, Cabot’s has satisfied many a sweet tooth and... frightened many dentists. For real, they have a sundae called The Dentist Disaster, made with all kinds of candy-infused ice creams (think Heath, Snickers, Milky Way, and Reese's) doused with hot fudge, caramel, and a bunch of other sundae toppings, plus MORE candy in the form of Reese's Pieces. We'd call them anti-dentites if they weren't giving the dentistry community such robust business. Folks have a lot of love for J.P. Licks, and for many good reasons. Like their rotating monthly flavors (Fresh Peach, Cake Batter, Rocky-er Road). 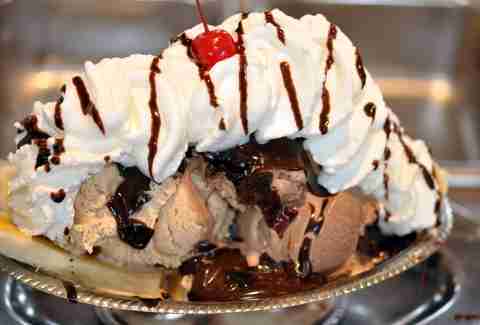 And their brownie sundae. 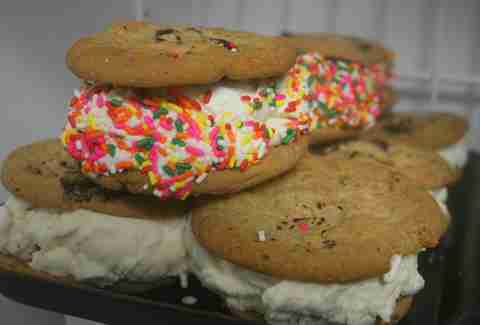 But the pro move here is the Chipwich. So pure. So good. They bake their own cookies in house and then stuff them with some of the aforementioned ice cream (chocolate chip/vanilla is the standard combo). Oh, and they're even better rolled in jimmies. They're sold individually or in four-packs. So... four-packs. Local mega-favorite Christina’s crams their freezers with an abundance of homemade ice creams and sorbets, including not-your-average choices such as adzuki bean, coconut Butterfinger, green tea, and banana cinnamon. They are, of course, equally adept with the tried-and-trues (malted vanilla, cookie dough) that keep everybody coming back. All the time. Even though the line will be out the door on any Summer night. 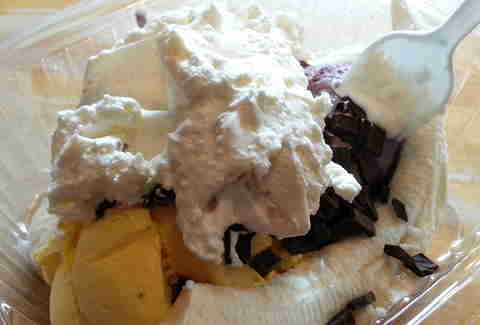 If you’re indecisive (and you are) you should get the large banana split: your choice of any three scoops, three toppings, and whipped cream or marshmallow. 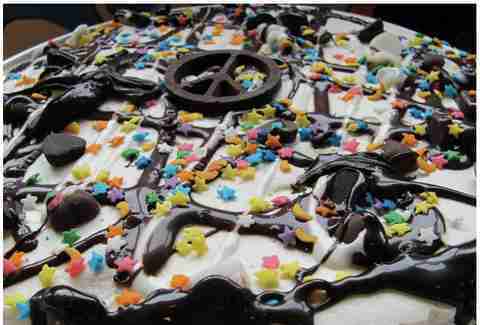 Before there was the Cronut, there was the ice cream pizza. Pretty much the only thing you need to serve at a child's birthday party (or any party for that matter), a rich brownie crust base supports vanilla bean speck ice cream, E&B's famous hot fudge and marsh "mellow", a chocolate peace sign, cosmic moons and stars (no clovers, diamonds, or horseshoes), and chocolate raspberry "bleeding" hearts. Bonus: this beauty serves 12-15 adults, 15-18 children… or maybe just one you. Rialto has kept it real, Italian-style, in Harvard Square since 1994. While you’re basking in the afterglow of bucatini with lobster, savor the frozen chocolate and licorice truffle. You’ll be glad you did. 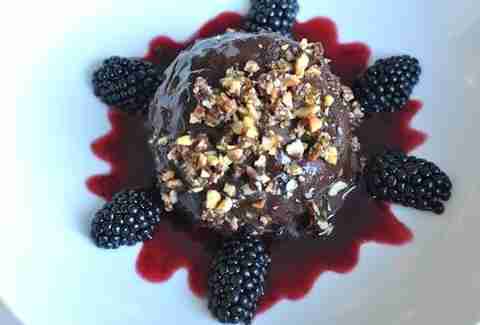 Dark chocolate gelato and Calabrian black licorice gelato are dusted with hazelnuts, ringed with blackberries, and drizzled with blackberry sauce. So yeah, maybe order two. Chef/owner Ana Sortun and her crew make some serious magic happen at their Mediterranean hideaway on Hampshire St. 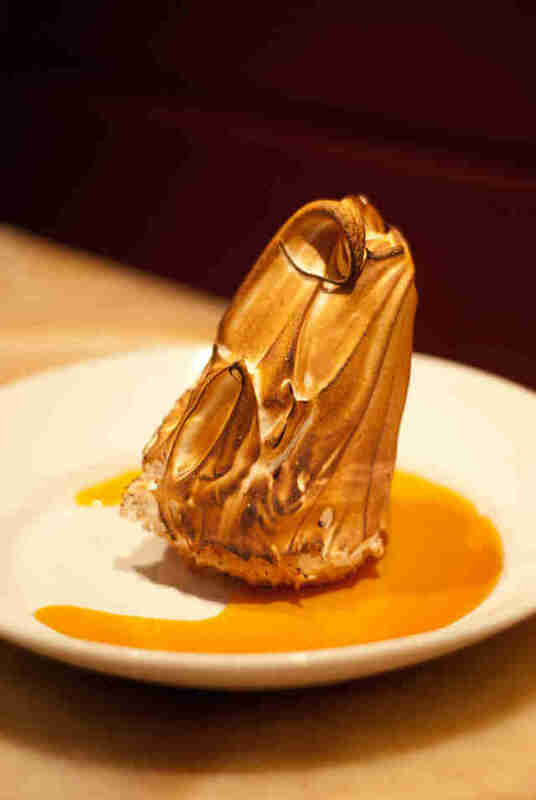 Pastry Chef Maura Kilpatrick takes it all to the next level with the legendary tower-like Baked Alaska. A chewy coconut graham cracker crust provides the foundation for coconut ice cream crowned with a sculpted and torched meringue and passion fruit caramel sauce. This cozy gem in the South End is known for its artisanal pizzas (go for the fig, bacon & Gorgonzola) and other Italian specialties, but it’s also dishing out house-made ice creams and sorbets. 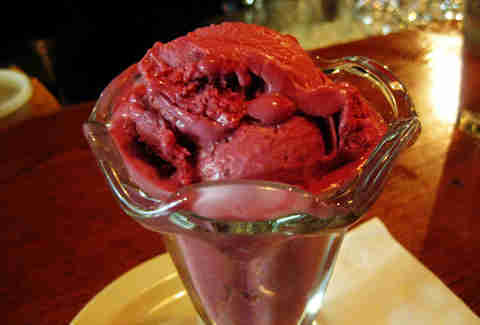 Sure, you can go with a dish, a cone, or a frappe, but wouldn't you rather go with the "Adult" Ice Cream Soda: raspberry Belgian Lambic with vanilla ice cream. Yes, yes you would. 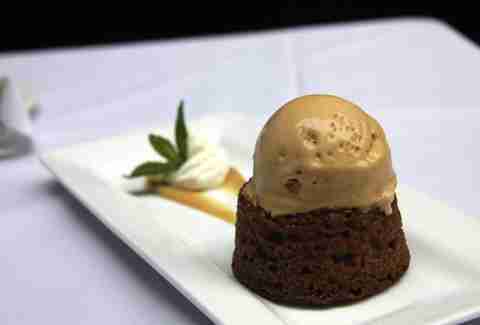 Executive Chef Thomas Borgia rocks New American comfort food, and he ends on a high note with the Sticky Toffee Pudding. This gooey goodie comes complete with toffee pudding topped by burnt sugar ice cream and a toffee sauce/whipped cream sidecar. It’s the perfect richer-than-rich finish after you’ve gobbled up a crispy pork belly sandwich. Healthy choices! The Ice Creamsmith takes hospitality and ice cream very seriously with 15 (+/-) flavors of 14% butterfat ice cream (three are seasonal) made on the premises. Just for you. 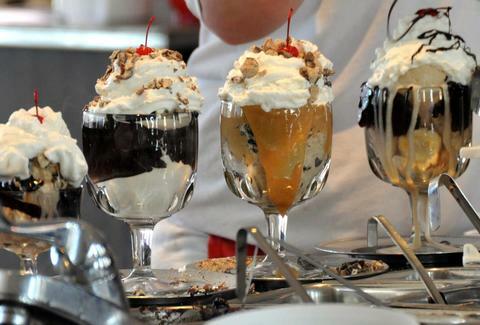 If you want to be king for a day, take your whole crew there for the Belt Buster Sundae: 12 scoops of ice cream, 10 mixin’s, six sauces, a banana, marshmallow, whipped cream, jimmies, nuts, and a cherry. Good luck. 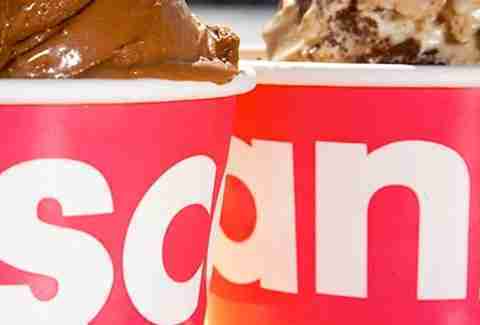 Kick back at the super-casual Saus and enjoy scratch-made goodness with Franco-Belgian flair. 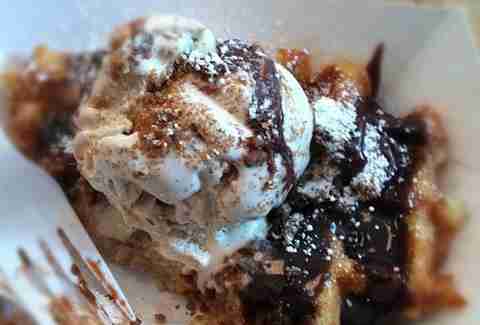 Chow down on some pommes frites (with more than 13 different sauces), then get to work on your Liége waffle sundae. It’s constructed from a Belgian street-style waffle, one scoop of Christina’s ice cream (your choice), and speculoos cookie crumbles. Then you can "saus" it with salted caramel, dark chocolate hazelnut, lemon cream, berry berry, or Biscoff cookie spread. Or all of them, because you've gone this far... what, are you just going to stop now? Owners Tim and Bronwyn Wiechmann honor the purity of the ingredients in every bite of their nightly French-inspired three- or six-course tasting menus. Especially dessert. A real standout is the diabolically simple T.W. Sundae. 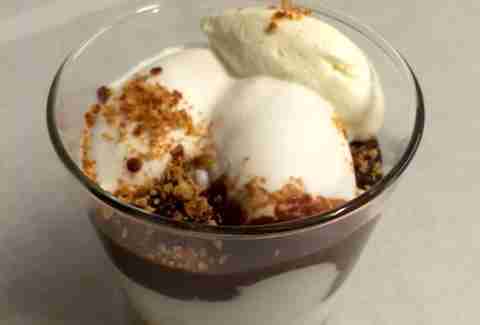 It has vanilla ice cream and hazelnut praline covered in a comfy blanket of Valrhona ganache. It's luxurious excess in a glass. Of course, this list would not be complete without Toscanini’s, at least as long as this author values his safety (he does). 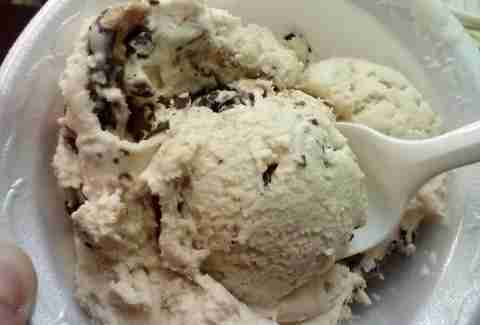 Critics and regular Joes agree that Tosci’s wares are some of the best in the biz, so stop in for a scoop or carry out a pint of any flavor. And there are many. They have 40 in regular rotation, but it’s those chocolaty chocolate ones that will get you every time. Or, rather, you will get them. There’s Belgian Chocolate, Cocoa Pudding, Black Bottom, Rather Dark Chocolate, Mexican Chocolate, Aztec Chocolate, Orange Chocolate, Chocolate Sluggo (bam! ), and Butter Chip. And then there’s the Burnt Caramel. And Ginger Snap Molasses. We could go on, but we know you’re already on your way there.